This week we’re learning about a pair of 19th-century geniuses, and the friendship that gave rise to the era of modern computers. 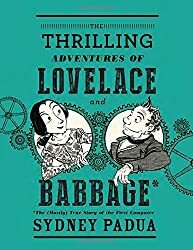 We’ll speak to artist and animator Sydney Padua about her graphic novel The Thrilling Adventures of Lovelace & Babbage: The (Mostly) True Story of the First Computer. We’ll also talk to Suw Charman-Anderson, founder of Ada Lovelace Day, an international celebration of the achievements of women in science, technology, engineering, and math. This entry was posted in The Art of Science and tagged Ada Lovelace, Charles Babbage, Podcast, science for the people, Suw Charman-Anderson, Sydney Padua, TALB, the thrilling adventures of lovelace & babbage. Bookmark the permalink.